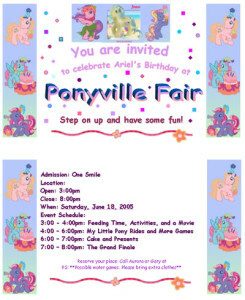 I helped a friend throw a My Little Pony party for her little girl with the help of this site. She was turning 4 years old and loves My Little Pony. So, we decided to have a “PONYVILLE FAIR” for her daughter. They were very simple; balloons in purple, pink, light blue and teal; streamers in hot pink, pale pink, purple, and lilac were hung around the house and outside. We bought the My Little Pony party ware— plates and tablecloth and added actual My Little Ponies to the table to weight down the balloons. We purchased cardboard star cut outs in purple, magenta, and pink pearl and hung them in the doorways from light fixtures, and on the fence in the backyard. Also, we made sidewalk flags to mark the My Little Pony party house. We purchased felt rectangles with purple, pink, and blue hearts from Wal-Mart along with dowel rods. We hot glued the felt to the sticks and placed them up the sidewalk to the door. We set up carnival-like games, such as the dart throw. Then, we hung a pink plastic tablecloth with pink/purple streamers around the perimeter to serve as the area the balloons would be hung. We did this for each game station. Other games, were coin toss (3 pennies tossed in a bucket), ring toss (3 hula-hoops tossed around a blow up purple unicorn), and hula-hoop toss (3 footballs thrown through a hula-hoop). We had to place the hula-hoop on a plant hanger that was attached to the fence, so the ball would pass through but not keep going. We had prizes set up in 3 categories— small, medium, and large, so depending on how many coins, balls, rings, or darts made it would depend on what prize they would get; 1 = small, 2 = medium, or 3 = large. We also had a kiddy pool set up outside with floating ducks. The kids were able to pick out a duck from the pool, by age group, and each duck would have a ‘s’, ‘m’, or ‘winner’ on the bottom. This would represent a small, medium or large prize. We all live in a relatively new neighborhood, so we don’t have full grown trees to hang a piñata. So we filled balloons with novelty toys, such as spinners and pill puzzles, for the kids to pop instead. The mother placed a few coloring pages of My Little ponies printed from the My Little Pony website in a few balloons for the kids to win a bigger prize. A pony was rented for a couple of hours to ride around the yard. We made goody buckets (sort of a feed bucket) from Easter buckets purchased after Easter for $0.10/each. We placed My Little Pony party coloring pages, crayons, stickers, and plenty of candy in each one. The kids also used their buckets to hold all their prizes from the games. hicken nuggets and spaghetti, was placed in the buckets to represent feed buckets for little ponies. We placed a movie in for the kids to watch while they ate. Everyone got a picture on the pony with the birthday girl, and so this can be sent in the Thank You Card to each family.